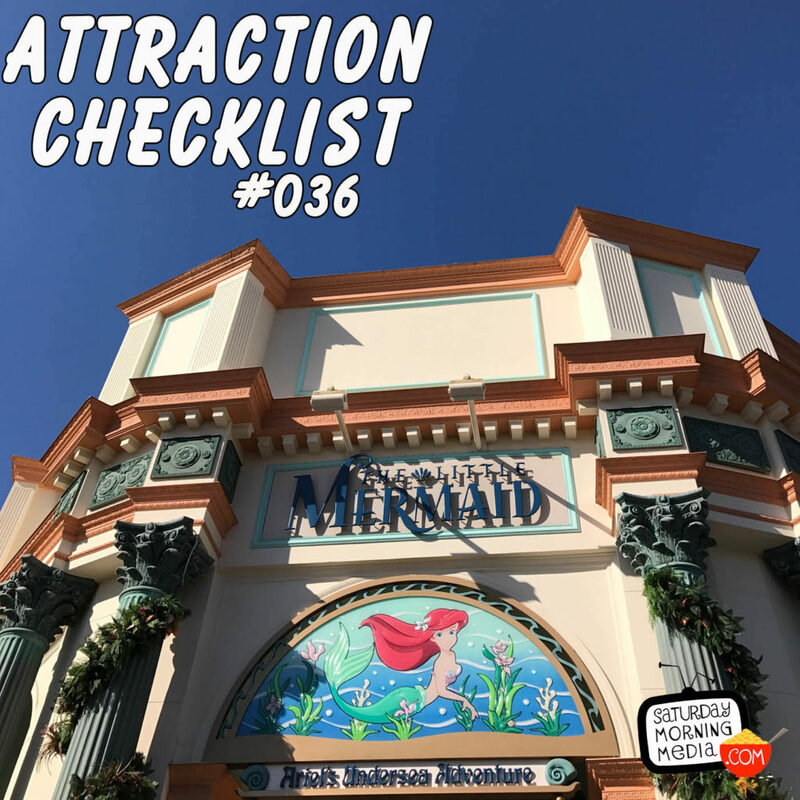 http://www.attractionchecklist.com – Our next stop is Disney California Adventure to ride The Little Mermaid – Ariel’s Undersea Adventure to see how it compares to Magic Kingdom’s version. Along for the ride is Suzie and we discuss our thoughts after you ride along with us Recorded on November 24, 2016. As a companion piece to last episode, this episode we are headed to Disney California Adventure to ride The Little Mermaid – Ariel’s Undersea Adventure. The guide map’s lackluster description of this ride says, “Be part of Ariel’s world aboard this attraction!” There are no age or height requirements for this attraction and the Thrill Level describes the ride as bing a Loud, Dark Slow Ride. Before we set sail, here are five fast facts about The Little Mermaid – Ariel’s Undersea Adventure at Disney California Adventure. 1. Located in the Paradise Pier (soon to be Paradise Park) section of Disney California Adventure, The Little Mermaid – Ariel’s Undersea Adventure officially opened on June 3, 2011. It took over the spot in the park previously occupied by Golden Dreams, a film about the history of California narrated by Whoopi Goldberg. 2. The statue of King Triton on the attraction’s exterior was related there from the, now defunct, Triton Gardens in Disneyland. 3. The mural that can be seen in the ride’s load area where you board your clam-mobile is 86 feet long and was painted entirely by hand. 4. The animatronic figure of Ursula in the attraction is the biggest on the ride measuring 7 1/2 feet tall and 12 feet wide. 5. This attraction boasts a tribute to the movie The Incredible Mr. Limpet, a film where Don Knotts turns into a fish named Mr. Limpet. In the Under the Sea sequence of the ride, Mr. Limpett can be spotted directly across from where Ariel is dancing. So now, let’s ride The Little Mermaid: Ariel’s’ Undersea Adventure at Disney California Adventure and see how it compares to Magic Kingdom’s Under The Sea – Journey of the Little Mermaid. Suzie is along for the ride today and after we ride we’ll discuss out thoughts on this attraction. This is a binaural recording so if you have headphones put them on now as we experience, The Little Mermaid – Ariel’s Undersea Adventure at Disney California Adventure.